Food safe suction and delivery hose for foodstuffs (milk, delicate food liquids...). Anti-abrasive blue outer coating, white inner coating, reinforcing textile braids with double spiral into the wall. Temperature resistant from -30 to +80°C. 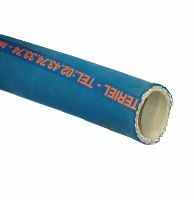 Very flexible and lightweight hose. Supplied in 15, 20 or 40 meter coil.